If you’re shopping for a new mattress, it might be time for an upgrade. Maybe you’ve been sleeping on a queen or king mattress and want something a little bit better. 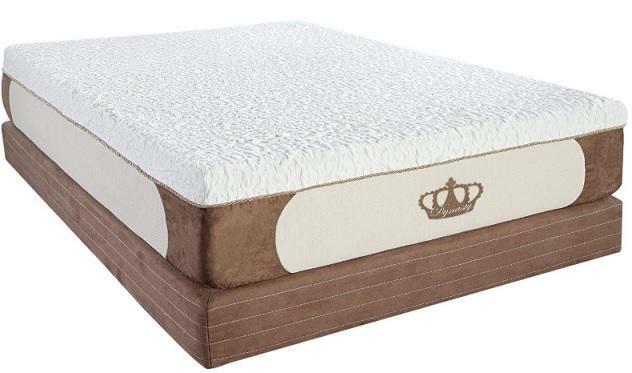 A California king mattress is great choice! Of course, as with any major purchase, you should do your research. It’s essential to know what you’re looking for in a mattress, especially if you’re wanting an upgrade or want to try something new. Before you begin shopping, you should think about what’s important to you in a mattress. Mattresses are not “one size fits all”. Everybody has their own personal wants and needs, so those need to be taken into consideration before the search begins. For this purpose, we have come up with a list of the most important considerations that you should make while you’re shopping for the best California king mattress. Additionally, we have researched California king mattresses and narrowed it down to the five best ones available. We want you to know exactly what your options are! Using reviews and other tools can help you to make an informed decision when it comes time to make a big purchase, such as a mattress. 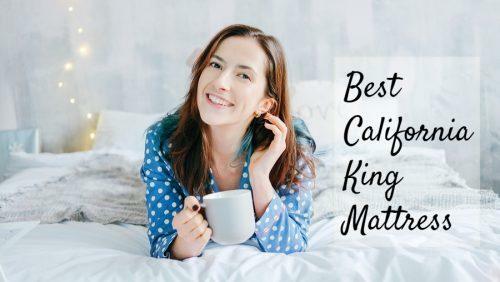 Let’s take a look at the factors to keep in mind and then see some of the best California king mattresses on the market! We’ve selected the five best California king mattresses on the market. These are all great choices, so you can’t go wrong with any of the ones that we have chosen to include. Keep your own personal preferences in mind as you take a look at the ones that we like! The DynastyMattress New Cool Breeze Mattress is another affordable option for a California king bed. It’s a little bit more expensive than the previous option, but it’s still very affordable. It comes in a wide range of sizes in addition to the California king size you are likely looking for. It only comes in one thickness of 12 inches. It’s great for pressure relief. It is made of gel memory foam, cool airflow foam, and high-density foam. Altogether, this combination is very comfortable. It allows for plenty of airflow to keep you nice and cool throughout the night. Another bonus is that the mattress cover is removable so that you can wash it. You just have to unzip it around the edges. It’s very simple. There is a 30-year warranty and a 120-day trial on the New Cool Breeze mattress. 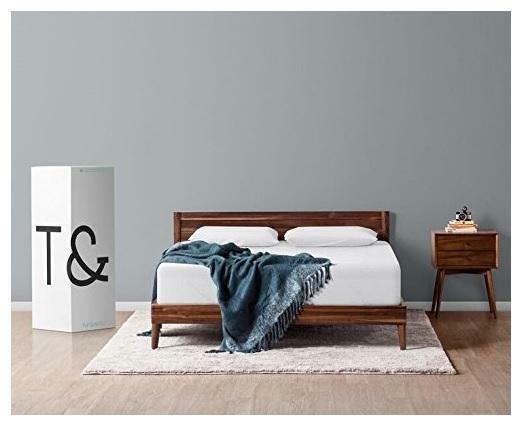 The Tuft & Needle California King Mattress is the most expensive mattress to make our list, but it’s definitely worth the extra money. It’s made of adaptive foam, which is both bouncy and supportive. This foam is high-quality and doesn’t give you a sinking feeling. Many users have found that this mattress gives them the back support that they need. It helps with pain and tension. The results are usually almost immediate! If you’re looking at this list, you’re likely shopping for a California king mattress. Nonetheless, this one is available in all standard mattress sizes. Only one thickness (10-inch) is available, but this is very comfortable for most users. What’s great about Tuft & Needle is that they offer a 10-year warranty and a 100-night sleep trial! 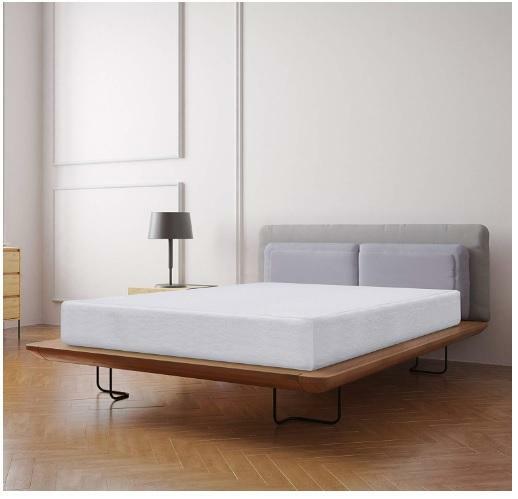 The Lucid 10-inch Gel Memory Foam Mattress was created with a dual-layer system. This is made up of gel-infused memory foam and high-density foam base. This provides a great deal of support. The firmness is medium, so it’s great for partners with opposite preferences or for anyone who doesn’t know which firmness they would like. The mattress and its cover are ventilated so that you stay nice and cool. It’s available in all of the standard mattress sizes! It’s 10 inches thick. 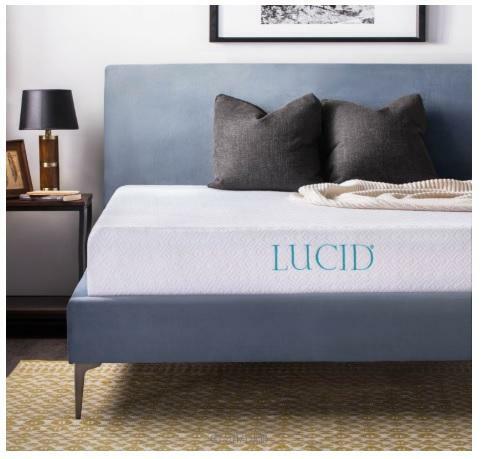 It only comes in one thickness, but Lucid does have some comparable mattresses that are available in other thicknesses. Lucid offers a 10-year warranty against manufacturer defects. 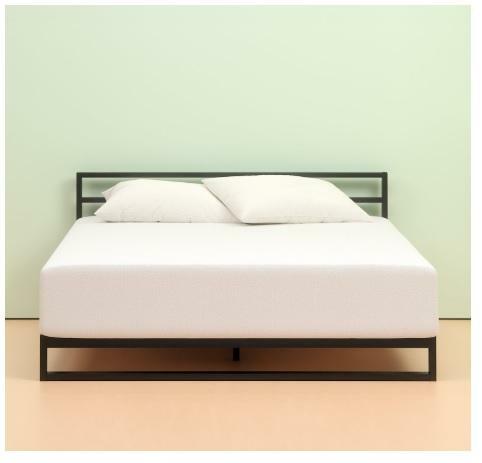 The Zinus Memory Foam Green Tea Mattress is the last one on our list, but it’s still an amazing mattress! It’s made from green tea infused memory foam, along with high-density foam and comfort foam. The green tea works to kills bacteria naturally. The combination of these foams makes for a very comfortable sleeping surface. It’s pretty affordable too. It comes complete with a 10-year warranty, but there isn’t a trial period. This mattress comes in a variety of sizes and thicknesses to choose from, so it can work for just about any user. You won’t be settling when it’s time to make your decision! What Should I Consider When Shopping for a California King Mattress? When you’re searching for a new mattress, there are things that you should be keeping in mind. Remember that a mattress is a pretty big investment so you’ll want to make sure you’re getting what you want. We’ve outlined some of the most important factors to think about while you shop for a new California king mattress! Because California king mattresses are a larger size, you might be spending a little bit more on them. This isn’t a problem as long as the mattress is worth the extra money. While you are shopping, do your research to make sure you’re getting a good mattress for the price. Just because a mattress is more expensive doesn’t mean it’s going to be more durable or give you a better night’s sleep. There are plenty of great mattresses that are very affordable! Before you start shopping, look around and get a feel for how much a California king mattress should cost. This can help you to set a budget and to distinguish a good deal from a bad one. Many mattress companies include warranties with their mattresses. These are nice because they can give you some added protection in case anything would happen to your mattress. Not all mattresses come with a warranty though, so you will have to decide how important this is to you. If a mattress doesn’t come with a warranty, you should be prepared to potentially pay for those repairs or a replacement on your own. This isn’t a problem, but it’s something to remember. Some warranties are pretty inclusive as well. Many of them only cover manufacturer errors. They are also only valid for a given amount of time. This ranges from a couple of years to a lifetime. It just depends on the company. Some mattress companies offer awesome trial periods! A trial period allows you to sleep on a mattress for a given number of days before you have to make a final decision. Unfortunately, not every company has these. It’s definitely something to look for. Every person is different and has their own individual sleeping preferences. Being able to try out a mattress for a month without any pressure to keep it is great! The duration of the trial periods varies by company. They’re usually around 30 days to 90 days. A few go up to an entire year though. A more limited trial period is better than none at all! This one is based solely on personal preference. Some folks prefer a firm mattress while others like a plusher one. Try to figure out what you like best before you begin shopping. This can help you to narrow down your selection. If you aren’t sure which you prefer, you should feel a few different types of mattresses. When in doubt, opt for a medium firm mattress to give you the best of both worlds. Similarly to firmness, thickness is also dependent on your preference. Some mattresses come in a range of thicknesses while others are only available in one. In general, the thicker a mattress is the plusher it will be. Thus, thinner mattresses are somewhat firmer. If you’re not sure which thickness to purchase, go for one in the middle. When you buy a nice mattress, you’re hoping it will last for a while. You want to buy one that can hold up to years of use. Some mattresses are going to be more durable than others. It can be tricky to tell whether a mattress will be durable until you actually use it though. To figure out the durability of a mattress, you should take a look at reviews. Look for reviews from people who have been using the mattress for several years. Additionally, remember that a more expensive mattress is not always more durable. Often, people think that they need to buy their mattresses from the big name companies. This isn’t always the case. More and more mattresses are becoming available. Many of them are from less well-known companies, but they are still amazing options! It might make you feel better to buy a mattress from a popular brand, but it’s not a necessity. With the right research, you can find a great mattress from a smaller company as well. As you’ve probably gathered, there’s a lot to consider when it comes to buying a new mattress. This doesn’t have to be a challenge though. There are plenty of resources available that you can use to make this big decision. Be sure to keep all of the factors that we mentioned in mind. Additionally, take a look at product reviews. These can help you to make an informed purchase that you’re truly happy with! 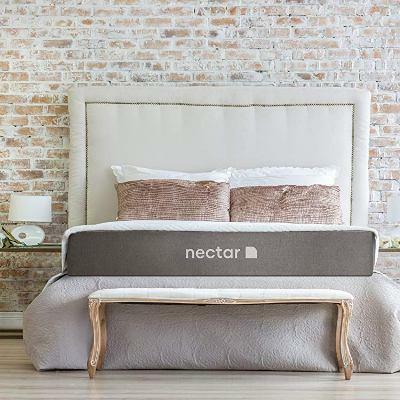 Where California king mattresses are concerned, the Nectar Sleep Memory Foam Mattress is our top pick. It has everything that you’ll need in a mattress at a very affordable price. It’s also got a great warranty to give you the protection that you want! It’s one of the more versatile California king mattresses, so it’s great for couples. Any of the mattresses that made our list can be the perfect choice! Part of the mattress shopping experience is finding the one that you like the best. Not every mattress is going to work for everyone, which can make the search tricky. Of course, with enough research, you can get exactly what you want in a mattress. Everyone has their own personal preferences and needs. Finding the right mattress can change the way you sleep and live!